Voyagers! 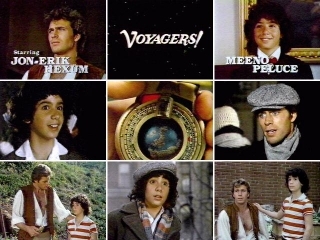 features Phineas Bogg (Jon-Erik Hexum) as a member of the time travelling Voyagers responsible for keeping history on track. Phineas appears outside 12 year old Jeffery Jones bedroom unexpectedly. Jeff falls out a window when he tries to prevent his dog from running off with Phineas' chronological guide book. Phineas jumps out the window after Jeffery and uses his OMNI to save them by transporting them through time. Unable to return Jeffery to his own time Phineas uses Jeffery's keen historical knowledge to navigate through history and keep history on track. The Omni is a hand held device that not only serves as time machine, but also warns when history's turning points are in jeopardy. A flashing red light indicates when things are bad and a flashing green one when they have been restored. Voyagers! ran one season from October 1982 until July of 1983 before it was cancelled. Each of the original 20 episodes included a variety of historical figures often from different time periods with some common link that requires Phineas and Jeffery to make multiple stops in time eacp episode to set things right. For example, in the second episode Created Equal Phineas and Jeff find themselves in 73 B.C. Rome where Spartacus never leads the slave revolt. The pair narrowly escape becoming slaves themselves by transporting themselves via the OMNI to Hannibal Missouri circa the late 1800s where they discover Harriet Tubman is still a slave an never founded the Underground Railroad. Jeffery and a young Samuel Clemens (aka Mark Twain) attempt to free Harriet and set history straight. Bogg and Jeff, must then travel back to Rome and free Spartacus so he can live to become the leader of the slave revolts. Voyagers! employed an interesting, but yet simplistic premise of connecting significant historical turning points. Interestingly enough the part of Phineas Bogg was originally intended for a much older, fatherly actor, but Jon Erik-Hexum convinced the producers to cast him in the role instead. Jon later starred in the short lived series Cover Up (1984) in which he played an ex-Green Berret soldier who goes undercover as a male model to crack a variety of illegal schemes. Jon was accidentally killed on the set of the series Cover Up by a self-inflected gun shot from a gun loaded with blanks. To read more on Jon Erik-Hexum's short career please check out one of the many fan pages devoted to his life. The best fan site on the web devoted to Voyagers! includes, episode guide, fan fiction, images, and cast bios for both Jon Erik-Hexum and Meeno Peluce. This Voyagers! website includes a detailed episode list with episode synopsis for each of the 20 episodes.